Depress the clutch pedal, and pause for a few seconds before shifting into R, or shift into one of the forward gears for a moment. This stops the gears so they do not "grind." NOTICE Do not shift to R before the vehicle comes to a complete stop. 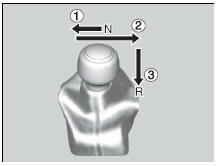 Shifting to R before stopping can damage the transmission. NOTICE Before downshifting, make sure the engine will not go into the tachometer's red zone. Should this occur, it can severely damage your engine. The manual transmission has a lockout mechanism that stops you from accidentally shifting into R from a forward gear while the vehicle is moving above a certain speed. Depress the clutch pedal, move the shift lever all the way to the left, and shift to R.
If you still cannot shift into R, apply the parking brake, and turn the ignition switch to ACCESSORY I or LOCK 0*1. 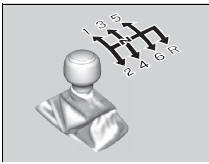 Depress the clutch pedal and shift into R.
Keep depressing the clutch pedal and start the engine.